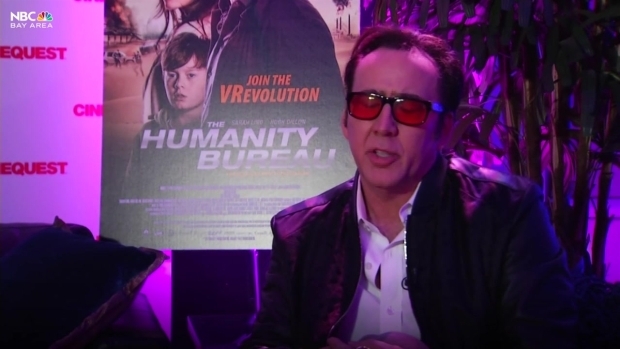 Nicolas Cage has played many different roles in films but now he's ready to take on the virtual world with his new film, Humanity Bureau - a 7-part dystopian thriller about global warming through VR. 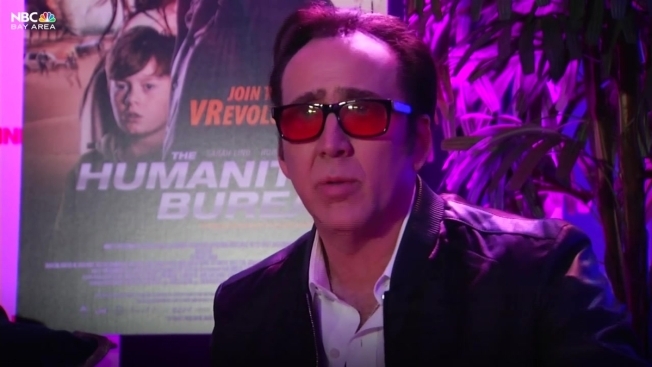 He's played everything from an angel to an alcoholic writer to a ghost rider - now at 54, Nicolas Cage is ready to take on the virtual world. The Academy-Award-winning actor was in San Jose to accept the Maverick Spirit award for Cinequest - Silicon Valley's version of the Sundance Film Festival - and promote his new movie, Humanity Bureau - a 7-part dystopian thriller about global warming through VR. NBC Bay Area sat down with the actor to chat about #TimesUp, virtual reality, movies, and of course, his favorite for the Oscars this weekend. How does it feel to be at the Cinequest Film and VR Festival? I’m very happy to support the festival I was happy to be invited, it’s always exciting to be with other film enthusiasts. Also, there’s a technological aspect of the film festival because of Silicon Valley. I think the two go together beautifully. What does the Maverick Spirit Award mean to you? Well if by maverick you mean, independently spirited, I have always tried to encourage that in fellow actors as well as in myself. I like to experiment; I see myself as a student of film. I have to stay eclectic; I have to stay interested by taking risks, by taking chances with the hope that I will learn something. I think there is a maverick sensibility to that approach. What place does virtual reality have in the world of cinema? I think it’s fascinating, I think it’s obviously new. There’s a lot of excitement and buzz around it because what we’re trying to do with it is to put people into the movie themselves. For me to be perfectly honest, the format is a bit uncomfortable because I came up in film trying to figure out ways to embrace my co-star but also flirt with one camera or possibly two or three. With a VR camera it’s multiple ones, you know it’s 360, it looks like a flying saucer; I had a camera over here and there was a camera here and this is the camera I’m trying to work with but I can’t get to that [other] camera, so I find it distracting. I feel that audiences individually have a secret connection with the “star” or actor, whatever you want to call us, and that is a very personal relationship and its individual for each member of the audience. They’re always going to want that connection to be able to look at the screen and look at their actor who they believe they know. I’m aware of that when I’m performing but I can’t do it with the virtual reality yet, I need more practice at it because there’s too many cameras and it’s throwing me off. I have to continue to try the process as it continues to grow and it becomes more popular and more cinemas take the format. It’s something that I think I need to develop a new set of skills to really be able to incorporate that and work well with it. Do you think audiences might feel disconnected from the film because there is so much going on? I do. I think that audiences, many audiences are going to want to keep the traditional format because of that relationship. They’re safe in their seats and they’re not being thrown into the movie itself. There’s going to be those of us who want to do that and that’s exciting and I think it should be a choice, you know, let’s try this but let’s also keep the traditional as well. For me, it’s why I got into movies and what I enjoy. I like having my safe, whether I’m at home or in the theater place to observe and enjoy from my little chair; I don’t know that I want to be in the movie when I’m not making the movie - when I’m just enjoying it. What are some of the takeaways you hope audiences will take from virtual reality? I hope that they, in the best sense, are extremely entertained. Almost like they’re on a ride, that they’re in the movie and that they’re participating in some way. If they could, they would communicate with the characters, and that’s probably next. Oscars are coming up, what is your favorite for best picture? Dunkirk. Dunkirk. Dunkirk. I love that movie. I think it’s just brilliant original filmmaking. It’s a filmmaker at the top of his craft. I’ve put it at my the top five favorite war pictures. I love what Nolan did with the way he would cut in and out, he would put us in the middle of the scene and I didn’t even know where the dialogue began and ended. It was bleak and stark and beautiful and the spitfire sequences we’re just absolutely stunning. I’m a big spitfire fan, I love that plane, Mitchell’s design just blows my mind. The only thing I’m sad about is I didn’t get to see it in 70 mm but I’m told they’re going to re-release it because of the Oscars; maybe I will get to see it in 70 now. Nolan believes, and I agree with him, that 70 mm will save cinema because you can only get that experience in the theaters. Whereas more and more movies are being deployed on video on demand and I don’t have any umbrage with that, I think it’s a great way for some movies to be viewable, which may not have a place to be seen. But I would also like all movies to be in theaters. You’ve played a wide range of characters in your career, what’s one character you hope to play in the future? Jules Verne’s Captain Nemo, I think I could really play that part without having to act. My first love, even before my parents, was the ocean. I just always had a connection with the sea and I know that I would be able to play that part and really mean it. There’s a lot going on in Hollywood right now, what are your thoughts on the #TimesUp movement? I support anybody, whether it’s gender or race or their beliefs, to be heard. I want everyone invited to the table and to be treated equally. I think it’s a good thing that it’s happening. A lot of the problems in the world have been caused by the male ego and I think it’s really time that ladies get their equal rights and fair share. Every time I’ve worked with a lady, whether it’s an actress or director, like Martha Coolidge, really when you think about it with “Valley Girl,” she directed me in that and really discovered me in many ways and liberated me. She made me free and believed I could be an actor. Before that, I was very stiff and nervous but she opened me up. Nicolas Cage discusses the importance of the #TimesUp movement at Silicon Valley’s #Cinequest Film Festival. Is “The Rock” the best Bay Area film? Thank you! I can’t say that maybe you can say that, but I certainly do love that movie. I thought what Michael Bay did with that was terrific. It was a dream come true for me to work with Sean. Those are some of my best memories in my entire body of work on set were my quite wonderful conversations with Connery. It was something else, I love him. Last question, have you found "the treasure"? I have not found the treasure but I want to! I would like to find the treasure; especially right now! I love those movies, it made a lot of people happy, and I would love to do another one for sure.